For those interested, I've also figured out how to access the entirety of the beta version of the game (in Japanese). See this thread for details. 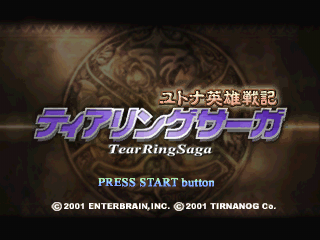 Acquire a Japanese-version TearRing Saga BIN file. Ripping the game from the disk, you may end up with an ECM file, which is a compressed BIN. Use a tool like UnECM to decompress it. The patch is in xDelta format, so you'll need an xDelta patcher; I'd recommend xDeltaUI, available here on Romhacking.net. Just to be safe, apply the patch to a copy of your TearRing Saga BIN file. Use the patcher to patch the BIN file with the xDelta file found above. Load the patched BIN using whatever PS1 emulator you like. I've always used pSX v1.13 with no problems. Note: If you use ePSXe 2.0.5, please follow these instructions, or else the emulator will not run correctly. Failing that, try version 1.9.4. Note that because this is a Japanese game, circle is "yes" and X is "no." 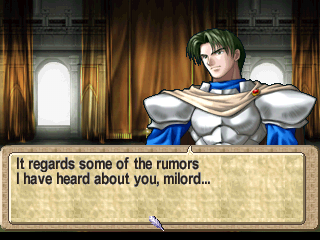 While we're on the topic, triangle is the "more info" button, like the R-button in the GBA games. L1/R1 go to the previous/next available unit (or previous/next page on the stats screen). If you're ever curious what controls are available to you at any time, you can press square to view them. Please let me know here or via PM! 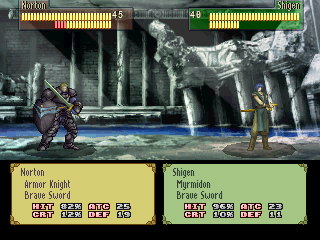 As was the case in FE1 through FE3, weapon levels are not weapon-specific. Instead, there is a Mastery stat (and associated growth rate), abbreviated Mst, that determines how good of weapons you can use in general. However, using the same weapon type a lot will give you other bonuses. The most useful bonuses are arguably the ones staff-users get, which increase avoid, healing power, and the chance that your healing staves will "critical hit" (healing more than usual). As for the weapons' bonuses, read on. There is no weapon triangle or trinity of magic. All: watch all battle animations. S Class: only animate "important" battles (bosses and stronger foes). 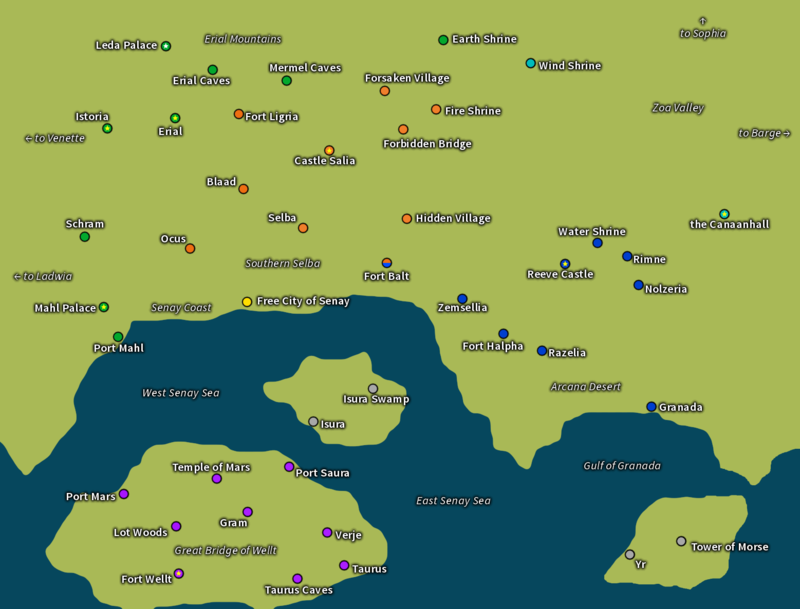 On Map vs. Stills: non-animated battles will either be (A) on the map or (B) shown but not animated. Note that there is no Resistance stat; instead, it is floor(MAG/2). While we're on the subject, "AS" is "Attack Speed," which is [spd - WeaponWeight], which can go negative. In order to double-attack an enemy, you need to be at least 5 points of AS faster than them. As in FE, if a unit can promote, it can do so with a specific item at level 10 (or by a story promotion for certain characters). However, promoting does not reset your level. The level cap for unpromoted/unpromotable units is 20/30 (resp. ), while for promoted units it's [level promoted at]+20 with a maximum of 40. However, there's an item called an Occult Book that lets any unit bump its level cap up by 10, to a maximum of 40. Supports are story-based and are triggered in two different ways. Some conversations have to happen on a map, in which case the involved units will have a "Talk to X!" notification on their support stat page. The other, more common way is by just having the pair of units in the same army at certain points in the story; they don't even need to be deployed for this type of support. Different supports can add anywhere from 4 to 15 points to all of Hit, Avo, Crit, and Ddg. There are small bonuses to Hit and Avo that can be gained by killing specific unit types, killing with specific weapons, or being deployed in certain environments. The game counts each of these up, and for every ten points in each, you get a +1 bonus. 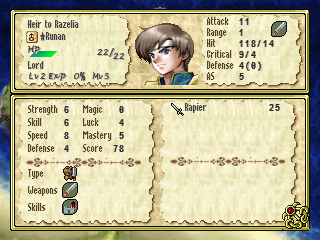 So if Runan has killed 34 marauder-type units, he'd get +3 Hit and Avo against them, or if he's been deployed on 11 frontier-type maps, he'd get another +1 on such maps. Each specific weapon counts up (invisibly) how many units it's killed. For each kill after 50, the weapon will receive +1 Critical, up to a maximum of +50 Crit at 100 kills--which would only be attainable from 0 through the use of a Hammerne staff. Alternatively, you can receive old weapons from villagers, which can come with quite a few kills on them already. If you do manage to get a weapon to 100 kills, it will randomly become either blue-starred or red-starred. Red weapons are cursed; they have a [31-Luck]% chance of backfiring, whereas blue weapons don't have this drawback. There are certain churches in the world you can get blessed (for a fee), which will exorcise all red-star weapons you have and turn them blue. The "Score" stat functions like the average power stat in Awakening in Fates--i.e., not a good gauge for how powerful a unit is at all. However, it does serve a purpose for calculating Exp gain for defeating an enemy. I think it's Mars; it's the Temple of Fire and fire has always been associated with Mars/Ares. Mars, its as BBM said. Also I'm glad someone decided to fix up that original patch, it got messy after the first few chapters..
Marth would be a cool reference, but I doubt that's what they were going for. Mars... There is no "th" in there. Also it's good to see that work is still being done. One question though; is Ickhoa doing work still on the Berwick Saga patch? Even a menu/item translation patch would be great there. There's another person on the team working on Berwick Saga, though at his own pace. Glad to see you've picked up this translation! I've wanted to play this game, and have the old translation, but was turned off from going too far into the game because of some of the faults in the translation. I know absolutely nothing about Japanese except desu, but I'd love to help in any way I can. Finally. Now the game won't randomly switch between Zeek and Zieg. Moshi Moshi.... Now pick up the Phone!! That is good to hear!! I am very happy someone is still working on it. I have already beaten the game (twice at that) in Japanese but I have seen the old translated version it is terrible Lol and very incomplete. I am happy to see this wonderful game has not been forgotten. Hey maybe with your translating of it more fans will find it! 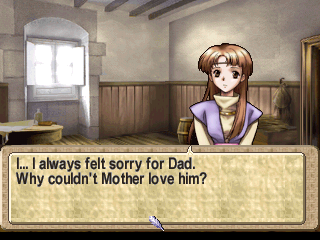 TearRing Saga needs more love it is part of the FE family too. Thanks for working on this, looking forward to it. I still dream someone, someday, will translate Berwick Saga. Then I can die in peace. About a thousand years ago, a group of settlers from the continent of Jugd cross the Moratonian ocean and settle on the continent of Lieberia, where they establish four dominions: Rivellia, Razelia, Nolzeria, and Zemsellia. After about two centuries, these countries join together into the Kingdom of Reeve (each becoming a duchy). However, the Zoa people, indigenous to Lieberia, grow increasingly concerned about the rise of the foreign-descended kingdoms, and they attack Reeve. Reeve's acting official, Johannes, subdues the Zoan attack. The Zoa people call upon their god Gerxel, who answers their summons and begins attacking Reeve as a great black dragon. Reeve falls, and the Zoa Empire conquers the continent. In response, the dragon-goddess Miradona sends her daughter Yutona to join with the leader of the anti-Zoans, Carluon, and together they slay Gerxel. Carluon becomes king of the re-established Kingdom of Reeve (with its four duchies), and he marries Yutona. Garlon and Yutona have four daughters: Muse, Rachis, Kranion, and Neuron, the goddesses of water, wind, earth, and fire. 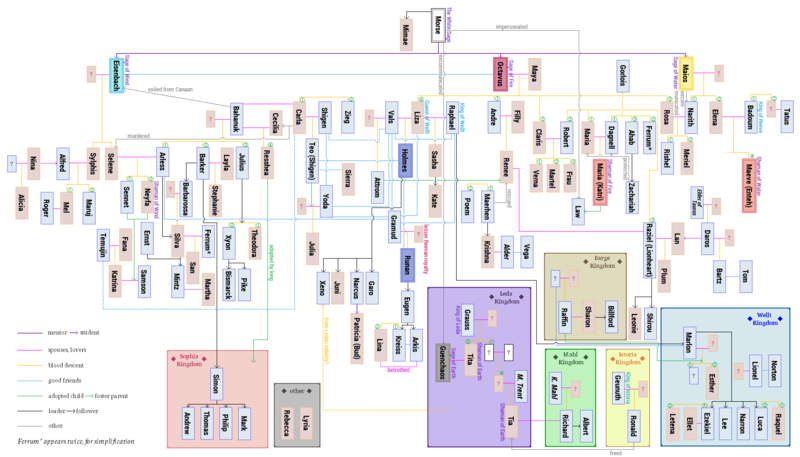 At some point or another, the dominion separates (or perhaps people just go settle elsewhere) into four kingdoms: Reeve, Canaan, Leda, and Salia. The four goddesses are revered as the patron dragons of the respective kingdoms, and they begin bloodlines of holy priestesses. Other kingdoms that show up between then and the present are Mahl, Wellt, Barge, and Istoria. (Istoria isn't important.) The Zoans are also still around, many of them still Gerxel-worshippers who don't think he's dead. About 50 years before the present, war breaks out between Salia and Leda. Leda loses and is basically wiped off the map, and Mahl (Leda's ally) is made a suzerain state to Salia, though Salia is also in rough shape. About 23 years before the present, the Gerxel Church and the Zoans begin revitalizing, and King Bahanuk of Canaan decides that they're a threat to the well-being of the continent. For the next twenty years, Canaan and the Zoans fight, during which time Reeve repeatedly refuses to help their ally Canaan, wishing to remain at peace. About 2 years before the present, Bahanuk suddenly makes peace with Zoa and declares the revival of the Zoa empire. Canaan turns on Reeve, but they are held off by Duke Gramud of Razelia. Prince Arless of Canaan, an advocate against the war, offers a ceasefire, and he and Gramud agree to meet at Nolzeria to discuss peace. 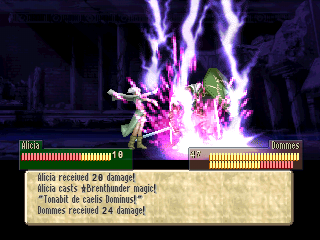 Then suddenly, the holy dragon Muse, who died centuries ago, appears out of nowhere and kills absolutely everyone at Nolzeria. Then Muse vanishes without a trace. Both Canaan and Reeve believe it to have been a dirty plot by the other kingdom, and the fighting resumes. At present day, Gramud's son Runan and his friend Holmes (himself the son of Admiral Vals, a privateer in the service of Reeve) flee from Port Granada, which had until recently been Reeve's last holdout. They arrive at the remote island kingdom of Wellt in the hopes that they will be willing to provide aid. I hope a Berwick Saga translation will be a thing 'cause I want to try LTCing that game! Othin said it's a fun one to play like that, and really different. Especially with the hexagonal grid. I should look at some footage of that to see how it works. Thanks for that. I'd love to play that sometime if a translation ever comes out! Berwick Saga is great! Like I said above, another person on the team is working on it at the moment, though at a gradual pace. I'll be very glad when it's finished, though, so that more people will be able to fully enjoy it! When you say "working on it", do you mean just translating the script or actually hacking / inserting the text in the game? Anyways, that's some good news! It will be inserted into the game! Our hacker definitely knows what he's doing, and the Chinese fan translators have also been helpful. Something worth noting is that if you're going to buy only one of the official guides for TearRing Saga, make sure to get the Complete Guide (the blue one), not the Player's Bible (the red one). The latter is just a promo book, and it doesn't cover the whole game. As far as I know, the blue one's got everything the red one has. [spoiler=old content, feel free to ignore]So, the names of the four dragons (ネウロン, ラキス, ミューズ, クラニオン) are derived from the Ancient Greek words νεῦρον (neũron, "nerve"), ῥάχις (rʰáchis, "spine"), μούσα (moúsa, "thought") and κρανίον (kraníon, "skull"). So far, I've been calling them Neuron, Rachis, Muse, and Kranion. However, would people prefer Mousa (pronounced /'mu.sa/) over Muse? I'm using Greek transliterations, not English derivatives/cognates, hence not Nerve/Sinew, Memory/Mammer, or Cranium/Harns. Mousa looks fine to me. I also prefer it slightly over Muse. I like Mousa, it's more flavorful. On one hand, Mousa does preserve the reference, but I think Muse is nicer to... look at/hear? And Muse still brings to mind thought because they're goddesses of literature or something?. Either is fine, but I lean towards Muse slightly.